Trump met with Kim on Tuesday in Singapore, where the two leaders signed a vaguely worded agreement. Critics also feel Trump has legitimized Kim by meeting with him and being highly complimentary in the process. Trump met with Kim on Tuesday in Singapore, where the two leaders signed a vaguely worded agreement that has been criticised by members of both political parties. As part of the agreement, North Korea said it would work toward denuclearization. But the document did not specify how such a process would occur, and Trump has been similarly vague on a process of verification. 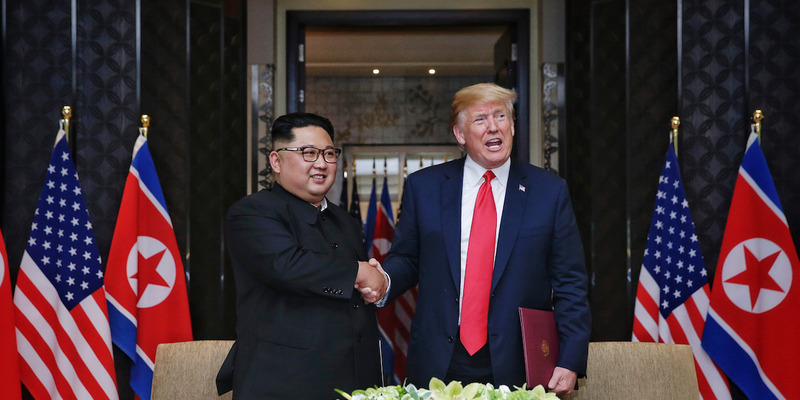 Trump also agreed to stop joint military exercises between the US and South Korea on the Korean peninsula as part of his negotiations with Kim. Consequently, critics have suggested he gave up a significant amount to North Korea for virtually nothing in return. Critics also feel Trump has legitimized Kim by meeting with him and being highly complimentary in the process. Trump described Kim, the leader of a repressive regime that’s been compared to the Nazis by the UN, as a “talented man” who loves his people.